Summary:The year is 2032, sixteen years after a deadly virus—and the vaccine intended to protect against it—wiped out most of the earth’s population. The night before eighteen-year-old Eve’s graduation from her all-girls school she discovers what really happens to new graduates, and the horrifying fate that awaits her. My Thoughts: I started this book and couldn't put it down until I was finished! Completely and utterly finished. No breaks, no stops, no doing anything until I was done. It's the future and a lot of things are different. We are introduced to Eve who will be graduating from an all girls school. She's top notch and will give a speech at the ceremony. Her life seems pretty good. She will soon learn new things and Eve and her friends are anxious for their futures. She will learn different trades in the City of Sand after graduation. Ever since The Plague, people are restless. Girls are sent to these schools and taught that men are dangerous. They are not to be trusted. So, when Eve stumbles upon what really happens after graduation, she's horrified. The future looked so good, until she realized what she and the rest of the girls would be doing next. Does the population need increased? YES! She sets out and escapes from the school into the wild. She needs to get to Califia which is a safe haven for people like her. She ends up meeting an unlikely ally along the way and they head out to a safe haven together. Things don't go expected as they stumble upon a boy named Caleb. Eve is hesitant to trust him or even talk to him but when her life is put in his hands, she has no other choice. Eve describes him as a dirty boy, and stinky when she meets him! This reminded me of how people don't always have soap and have to make do with what they got. And be happy, just to have simple things. She goes back to his homestead and we get to see her develop a relationship with him and all the other boys who live there. Eve and Caleb had such a precious relationship. I don't know how else to describe it. It was gentle, and caring, and oh so charming. Things don't turn out exactly how I had hoped, and now I want the next book! When I started this novel, I wasn't sure about it. Honestly, I didn't read much about it, because I didn't want to know what was going to happen. I wanted this one to be one of those that I heard a lot about when it came out awhile ago, but it just sat on my bookshelf until I was ready to read it. I picked it up, and started reading it, forgetting what the plot was about. Am I glad I did? YES YES YES! Overall: When does the next book come out again? haha, not soon enough! 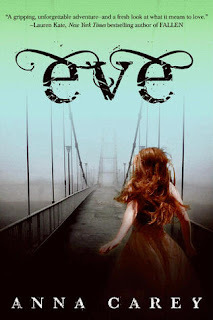 Eve was an imaginative book of what the future could be like. I love these kind of books, because we see different aspects of what the world could hold, and some of them are very scary to really think about it. I really loved Eve and I can't wait to read more by Carey. Cover: It's pretty! The colors just go together and the way the girl is looking out is just amazing. She knows something more is out there, but she's not sure what is. I've seen this book a lot, but was on the fence. But from the review, iit sounds like an awesome book, so I'm going to have to check it out. Thanks! Sounds like I need to get myself a copy of this! Lol I remember when this was coming out it was such a love or hate type of book. Everyone was either in love or hated it, there were hardly any inbetween those two strong emotions. Thanks for the great review, can't wait to read this one. Although I might wait till book two is out so I could read them back to back if I love Eve. I have ponder on reading this. I have seen this in the book stores. I keep debating on whether I should read it or not. Your review made me want to go out and buy it. :D I can't wait to begin. I love books that are hard to put down. I've seen this everywhere and it's been on my TBR/Wish list for a long time! I've read the first book in her MG series Sloane Sisters. I really need to grab this and read it! I've heard great things! Great review. =) I definitely need to pick this up soon!